In an effort to contribute to the public awareness campaign being carried out by proponents of lean urbanism, this article is meant to help expand the argument for lean development through the adoption of an ethical approach to how we advocate for the codification of lean urbanism. In general, the current talking points behind the arguments for lean urbanism can be characterized by highlighting the often negative economic realities behind our current development paradigm and then bringing attention to the economic benefits of less red tape holding back potential small-scale development. The Project for Lean Urbanism, the organization at the forefront of promoting lean urbanism, has adopted seven principles, or “platforms”, that outline the movement’s main focus areas. These platforms include Lean Building, Lean Development, Lean Business, Lean Green, Lean Regulation, Lean Infrastructure, and Lean Education. These platforms have in common the goal of highlighting best practices in lean development regulations and finance. The recognition of the role of bureaucracy and finance in preventing small-scale growth has been shared by many in planning, design, and development related professions for a long time. The genius of The Project for Lean Urbanism is not in holding this position, but in its ability to articulate and showcase the failures of our current development and finance models and provide attainable and attractive alternatives during a critical moment within the larger “metropolitan revolution”. The Project for Lean Urbanism has the platform and to a certain extent a responsibility to further the lean discussion through an emotive approach that incorporates moral and social values. In the 1960’s, French philosopher Henri Lefebvre coined the term la droit à la ville (the right to the city). The right to the city has been discussed as a strategy to counter contemporary neoliberal global financial restructuring efforts and as a means to prevent the continuing disenfranchisement of urban inhabitants across the world. It is important to understand the way Lefebvre and his modern contemporaries view the city in a market economy. The role of the city is to absorb surplus capital, to produce a surplus product in order to produce a surplus value and then facilitate the reinvestment of the surplus in order to create more surplus value. The continuous cycle of capital reinvestment has shaped cities throughout human history. As David Harvey outlines, there come certain episodes in time where opportunities to reinvest surplus capital are limited within existing urban forms and thus create the drive to reshape and rescale markets. He points out that this was one of Haussmann’s lasting legacies. Haussmann succeeded in rescaling Paris and facilitating the absorption of surplus capital through new debt-finance instruments and large infrastructure improvements. This effort to rescale urban forms and markets has occurred multiple times since, most visibly after World War II in the form of low density sprawl, and most recently through the globalization of debt and credit finance institutions which led to the Great Recession. Further discussion of what a right to the city would entail has provided us with two main concepts as pointed out by Mark Purcell. These two main rights, the right to participation and the right to appropriation, outline the implications of a right to the city. The right to participation is simple in that many decisions that influence public space should be rescaled from often national or international institutions or organizations (such as NAFTA, the WTO, and in particular, the IBC) to the urban inhabitant. In addition, the right to appropriation, or an increased ability to use urban space as one sees fit, is the other half of the right to the city. Lefebvre’s concept has been discussed by many in recent years. 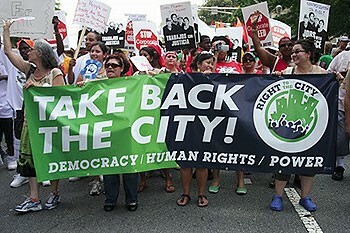 Even so, the common conclusion is that, based on Lefebvre’s work, the right to the city is a vague concept and unable to produce results as, according to Purcell, “the idea remains both theoretically and politically underdeveloped.” It is difficult to understand how the idea of a right to the city could improve the situation for the disenfranchised around the world without a political and physical framework. In this sense, lean urbanism is in the best position to provide the framework for achieving a new paradigm called for by proponents of the right to the city. The ability to effect and participate in development outside of the global debt-finance institutions of contemporary society is called for by advocates of the right to the city and enabled by lean urbanism. There is an opportunity to tap into the right to the city movement and incorporate certain concepts first developed by Henri Lefebvre to further the goals of a lean urbanism; a revamped municipal regulatory structure that allows small-scale development and infill opportunities for urban inhabitants that otherwise would not have access to the resources needed to shape the built environment within the current framework of development standards. By enlarging the argument for lean urbanism from primarily one of development finance and economic benefits, to a more inclusive argument that incorporates similar goals of a wide variety of social justice movements, lean urbanism can become an even more attractive concept to the general public. 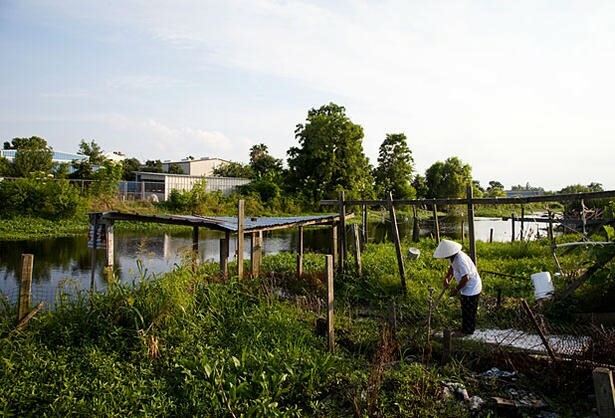 Agrarian Urbanism thrives within the Vietnamese community of New Orleans East. This is great — I’ve been thinking very much along the same lines.